The deputy leader of the Labour Party has backed a campaign to protect the Freedom of Information Act. 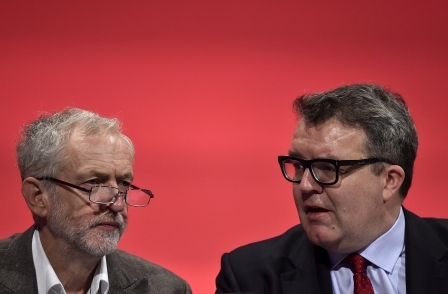 Tom Watson MP (pictured right with Labour leader Jeremy Corbyn, Reuters) has also said the Labour Party will "shortly be announcing a consultation to establish whether the FoI Act can be broadended and strengthened". He was speaking to the Birmingham Mail, which has today joined Press Gazette, the Society of Editors and Holdthefrontpage in telling the Government: Hands off FoI. More than 1,000 have signed a petition launched by Press Gazette urging FoI minister Matthew Hancock not weaken the act. The Government's Independent Commission on Freedom of Information is currently reviewing FoI and there are widespread fears it will recommend new exemptions and fees for requests. The Birmingham Mail has published a list of stories that never would have seen the light of day without FoI. These include stories about: child deaths at Birmingham's social services department more than doubling in four years – despite council claims that there had been no increase; more than 60 per cent of shoplifting offences in Birmingham city centre not being recorded or investigated; and a police officer receiving nearly £8,000 compensation from his force after being bitten by fleas while at work. The Mail story, which linked through to Press Gazette's petition calling on the Government not to weaken FoI, quotes Labour deputy leader Tom Watson as saying: "I associate the Labour Party wholeheartedly with this campaign. "The Freedom of Information Act has held public institutions to account and if it is diluted it will mean taxpayers lose out. "We will shortly be announcing a consultation to establish whether the FoI Act can be broadened and strengthened. "It is one of the most important pieces of legislation that journalists have to hold the powerful to account." The Mail also reported that its campaign had the support of the West Midlands' Police and Crime Commissioner David Jamieson. He told the newspaper: “FoI has been a valuable tool for accountability that I myself used recently to try to get information out of the Home Office. “I voted to introduce it in Parliament and helped introduce it into the Department of Transport as a Minister.